New Orleans Twenty-two years ago the Tides Foundation began giving the Jane Bagley Lehman Public Advocacy Awards on an almost annual basis to largely unrecognized local grassroots organizers and activists making a huge difference on major issues in what I have always called “the vineyards.” During my more than 30 years on the board of Tides from its founding 37 years ago by Drummond Pike until I went on senior status in 2009, the most fun thing I ever got to do was help decide and give out the JBL’s with Drummond, Russell Long and Susan Carmichael, Jane’s children, and Andrea Kydd, my old friend and comrade, much missed but now also gone. 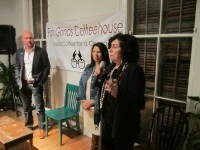 From the minute I heard that the JBL’s were going to recognize advocates who had stepped up for Louisiana and the Gulf Coast in the face of last year’s British Petroleum (BP) oil spill disaster, I started lobbying for various local freedom fighters and for the opportunity for Fair Grinds Coffeehouse to be able to host the awards ceremony in our 2nd floor Common Space. The awards winners and those in the final four were amazing. Brenda Dardar-Robichaux, former chief of the Houma Nation and a longtime advocate and organizer in defense of the Louisiana bayou country, coast area, and cultural traditions and livelihoods was there with her husband, Mike “Doctor Mike” Robichaux, her father, and a lot of her family from the Raceland area. The other winner was Marylee Orr, the long time executive director of the well known, Baton Rouge-based, Louisiana Environmental Action Network (LEAN), that is always at the table hammering away on the policy side. Close behind the winner’s circle was our New Orleans-based, Gulf Coast advocate, Aaron Viles of the Gulf Coast Restoration Network, who was also present for the ceremony. It was a great event with Rosa King and Casey Budesilich coming down from San Francisco to preside and present. Zee Thornton, Fair Grinds’ Manager, went over the line and saved Tides a small fortune by personally catering the event and drawing on her old tricks working as a line chef at some of New Orleans’ best restaurants. We just about had to chase people away after closing. Fantastic! On the other hand, every conversation I had was disturbing with the winners. Aaron and Marylee both mentioned conversations with activists in Alaska continuing to warn that based on their experience with Exxon and the Valdez spill, this could be a 20 to 30 year battle. 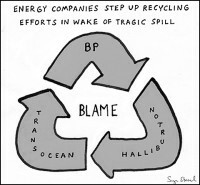 Viles was not ready to concede that BP could be his life mission. Aaron kept shaking his head that BP thus far had spent more in PR and “brand” protection in the media, than they had in actual Gulf Coast restoration, despite all of their claims. Everyone believed the biggest danger was dispersants; the chemicals used to “breakup” the spill. The after affects are not known, but continue to be seen as the biggest lurking danger. Zee’s oyster dressing was the best I had ever had, but Brenda’s family told Beth Butler from A Community Voice that they, sadly, were still afraid to eat oysters since the spill. Dr. Mike caught me on the balcony to tell me what he called “a long story,” but it turned out to be frightfully important. He has treated more than 200 victims of chemical poisoning who worked or were affected by the dispersants and the spill. Talking to other doctors, they are finding that the symptoms and response are the same as soldiers who came back from the Gulf War with similar chemical exposure. The tracking of problems and reactions is disturbingly close. I could say the good news is that Dr. Mike and his colleagues are coming up with a treatment regime that is helping, but the bad news behind the headlines is that few have recognized that this is a modern version of Agent Orange effects from what Dr. Mike referred to as “our war,” meaning Vietnam, as he was talking to me. These were happy people celebrating their awards, plaques, and the critical “no strings” cash contributions that come from this Tides JBL, but asking the organizers how they saw the future was guaranteed to take the smiles off their faces as they looked at the horizon and saw nothing but more hard work, hard times, and long struggle.